Is it any wonder that writers read and readers often write? We enjoy getting lost between the pages of a book, drawn into the world created by the author. We’re enthralled with the intoxicating power of the written word. 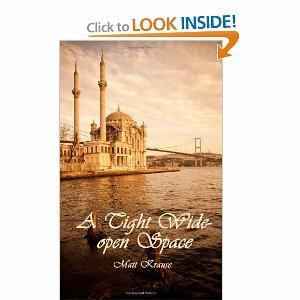 One of the best books I had the pleasure of encountering this year was A Tight Wide-open Space: Finding Love in a Muslim Land by Matt Krause (Delridge Press, 2011). As I read his evocative and quietly eloquent memoir about the life he builds after moving there with the woman he meets in a chance encounter, I knew that I wanted to share this beautifully written love song to Turkey with you. Even more, I was dying to get inside Matt’s writing mind and see how he approaches his craft. He was so generous in sharing his thoughts that we get two posts in lieu of one! Today’s post focuses on how he approaches writing, and in the follow-up Matt will share his views on the editing/publishing process. In addition to A Tight Wide-open Space, Matt has also published the popular Soapbox, a compilation of more recent blog posts. Writers often complain about the tortuous route their book takes from inception to publication, with unwieldy plot twists, continual rewrites and writer’s block in between. Surprisingly, Matt doesn’t share this view. While Matt advocates getting the writing out of his head and onto the page before moving on to the next project, I know many writers out there will be heartened to learn that the process itself takes him a little time. I found this insight about motion particularly telling. I know that I often solve plot problems or work through article ideas or certain passages as I walk the dog or am chauffering Daughter hither and yon, but I never associated gaining clarity with the actual movement. With two books under his belt and more writing projects in the works, it’s not surprising that Matt feels strongly about writers getting beyond the talking stage and putting their work out for others to see. Matt is taking his own advice to ‘go make new stories’. Naturally that involves more writing, but in the coming year he will also prepare for what promises to be an epic journey in 2013: a solo walk across Turkey, down through Syria and Jordan to Jerusalem, writing and reflecting along the way. So for all of you writers out there – aspiring, would be, tentative, striving, working or otherwise – it seems only right to end with a final shot of encouragement from Matt. I love it when I discover a new author. Sounds like Matt is one I need to interview for my Writers Abroad radio show.. and this sounds like a book I need to read and review too. Thanks for sharing, Linda. Matt is a strong writer with a grace that is captivating. Definitely one to watch! I love Matt’s, – get on with it – approach to writing. In fact, I shall take his advice, shut-up right now, and get on with it…. Great post! I agree with him, too. Get it out there, get feedback, keep going. Looking forward to your latest. I reviewed and promoted Matt’s book on my blog a few months ago. It’s a wonderful tale of a chance encounter that led to love and the struggle to adapt to the strange ways of a strange faraway land. Well done to Matt for his ambitious plans to walk to the Holy Land. Let’s hope the turmoil in Syria is resolved by then. Thanks Jack. Your words to God’s ears. Thanks for doing the interview Linda, glad to hear I could give you enough material for a second interview post! As for the Turkey/Syria/Jordan/Israel trip, even though I won’t start it until Sept 2012, as it takes shape I am blogging about it at http://www.heathenpilgrim.com. Thanks for mentioning it. By the way, I really enjoyed your contribution to Turning Points. Reminded me of the “you’ll connect the dots later” part of Steve Jobs’ Stanford speech (in that you can’t know at the time you take an action how it will fit in later). Thanks Matt, happy to write this. I love Jobs’ Stanford speech, I even blogged about it after his death. It’s amazing how seemingly unrelated things end up having a connective thread that can only be seen looking backward. I’m thrilled you enjoyed Turning Points. It is getting a great reception as the stories of reinvention and change really resonate with many. Off to put Heathen Pilgrim on my blog list! Excellent advise – definitely need to follow this as I am one of the “perfect desk, perfect timing” procrastinators. But at least you’d look great writing when you get it all perfect! Seriously, I do love Matt’s ‘get it out there and move on’ approach, and am going to practice it.